Kasen Williams became one of the preseason’s success stories. The Seahawks wanted to pass the wide receiver through to their practice squad then, but the Browns swooped in and signed him to their active roster. However, after the Browns waived Williams earlier this week, no one claimed him. He will now reside on Cleveland’s practice squad, Nate Ulrich of Ohio.com reports (on Twitter). The 24-year-old wideout has played in seven games for the Browns this season, twice catching four passes in a game. On the year, he has nine receptions for 84 yards. The Browns remain in search of pass-catching consistency, or general passing-game promise, but they chose to cut Williams to activate Corey Coleman. Recovering from a broken hand for a second straight season, Coleman is one of three 2016 draft picks among the Browns’ receiving corps. Kenny Britt and Sammie Coates have not excelled as first-year Browns, and the team also stands to get Josh Gordon back after what will be a three-year absence. So, the Browns could have more depth than they did recently. While the game probably will not effect the College Football Playoff, USC vs. UCLA will certainly have a ton of NFL Draft implications. Both starting quarterbacks, Sam Darnold and Josh Rosen, are considered two of the best QB draft prospects eligible for the 2018 NFL Draft, and will try to outshine each other during Saturday’s contest. The hyped matchup will be attended by 20 teams in some form, including the QB needy Jets, according to Rich Cimini of ESPN.com (Twitter link). The Jets were most recently connected to Wyoming signal caller Josh Allen, although Allen’s draft status has taken a big hit because of some early season struggles vs. top level collegiate defenses. New York’s season has gone a bit better than many expected, but they still have a long-term need at the QB position with Christian Hackenberg and Bryce Petty not looking like the long-term answer. The Jets, along with many other scouting departments will definitely get a good comparison of two of the top signal callers in all of college football in Los Angeles this weekend. The Texans have faced a number of injuries to key players including J.J. Watt, Whitney Mercilus and most recently quarterback Deshaun Watson. Now another playmaker who missed time early in the season will be forced to the sidelines again. Big play receiver Will Fuller will miss Sunday’s game with a rib injury, according Houston’s official injury report released on Friday afternoon. This leaves the team without another weapon for now starter Tom Savage and puts added pressure on DeAndre Hopkins to make contested plays due to increased attention from the defensive backs. Fuller missed the Texans first three games with a broken collarbone, but has since caught an impressive seven touchdowns in the past six games. Bruce Ellington is the next man up on the depth chart to try and replace Fuller’s downfield threat ability. The Broncos have just one tight end on the roster entering the weekend for this Sunday’s game against the Bengals. Both A.J. Derby and Jeff Heuerman have been ruled out, which leaves Virgil Green as the lone name left on the depth chart, according to Mike Klis of 9news.com. Derby is recovering from a shoulder injury that he suffered this past Sunday night and Heuerman is dealing with a knee injury. It should be noted that no Broncos tight end has been a huge factor in the team’s offense, with Denver mostly relying on the receiving combo of Demaryius Thomas and Emmanuel Sanders to move the football through the air. Klis does note that the team is expected to call up practice squad tight end Austin Traylor to take snaps as the team’s number two, adding that interestingly an unknown offensive lineman could work as the Broncos number three option if need be. 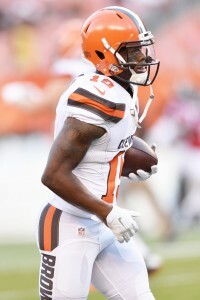 In order for the Browns to activate wide receiver Corey Coleman, they opted to waive fellow wideout Kasen Williams. The team has learned that Williams has passed through waivers and is free to sign with any practice squad he chooses, tweets Bob Condotta of The Seattle Times. The 25 year-old receiver first latched on with the Seattle back in 2015, but appeared in seven games with Cleveland so far this season. The Browns are releasing wide receiver Kasen Williams in order to make room for Corey Coleman on the active roster (Twitter link via Tony Grossi of ESPN.com). Williams will be subject to waivers, meaning that the league’s 31 other teams will have a chance to add him in the next 24 hours. Williams, 25 in December, appeared in just three games for the Seahawks between 2015 and 2016. However, he broke out during the preseason with nine catches, 208 yards and one touchdown. 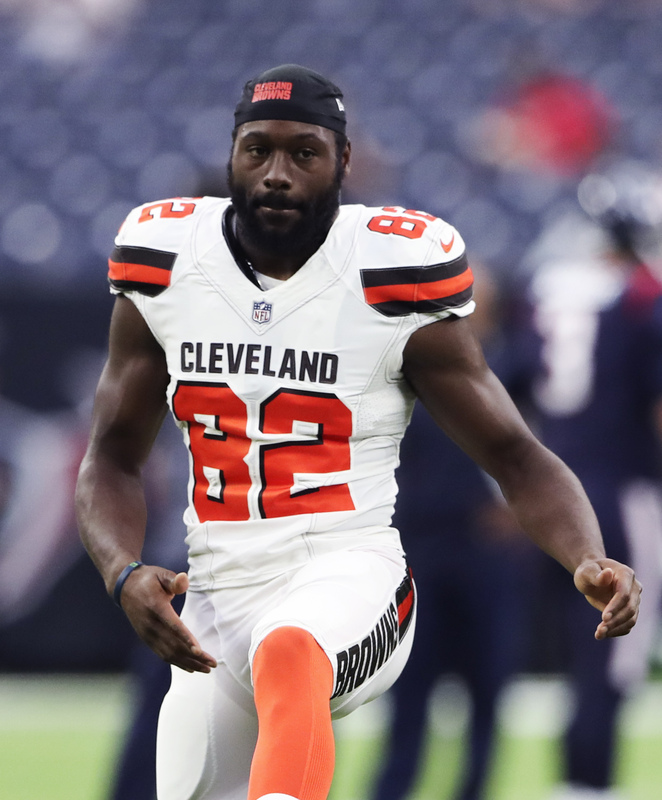 That performance caught the attention of executives around the league and the Browns pounced on the chance to claim him off waivers when he missed the Week 1 cut in September. Now that he’s back on the wire, it wouldn’t be surprising to see multiple teams put in claims on him. Waiver wire priority, of course, goes by the inverse order of the NFL standings. The Browns are the league’s worst team at 0-9, so the 1-9 49ers will have the first chance to add him to the roster. The 6-3 Seahawks may also have some interest in a reunion, but most teams are ahead of them in the queue. In his time with Cleveland, Williams appeared in seven games and pulled down nine grabs for 84 yards. John Elway spoke with T.J. Ward‘s agent earlier this summer and informed him the team did not intend to sign the veteran safety to an extension, with the GM telling media (including Nicki Jhabvala of the Denver Post) a Ward re-up was not in the team’s plans “at that point of time.” The Broncos made Ward one of the highest-profile cuts of the roster-slashing weekend, but Jhabvala reports the team did not come to a decision on Ward until last week. The rise of second-year safeties Justin Simmons and Will Parks, along with Ward’s injury history, played a role in the departure. Citing a lack of clarity during the process, Ward on Monday called the Broncos “completely unprofessional” regarding the separation. The divorce came with one season remaining on the 30-year-old defender’s four-year contract. The eighth-year safety will earn up to $5MM with the Buccaneers this season. Ward missed all of Denver’s preseason games with a hamstring injury and missed six games due to injury in three Broncos campaigns — two of which producing Pro Bowls. Mike Klis of 9News described the process as Simmons — a 2016 third-round pick who served as Denver’s third safety last season — Wally Pipp’ing Ward (Twitter link). Klis notes Elway gave Ward “every chance” to make this year’s team. Here’s the latest from the West divisions, shifting to Seattle, which just made the biggest trade in a week full of them. The injury to rookie Malik McDowell prompted the Seahawks to trade for Sheldon Richardson, Pete Carroll said, via the Seattle Times’ Bob Condotta (on Twitter). Currently on the NFI list, McDowell does not have a timetable for a return, Condotta adds (via Twitter). Carroll said the team could still look to add another defensive tackle (Twitter link, via Condotta). Richardson will play the three-technique position in the Seahawks’ 4-3 scheme, the fifth-year defensive lineman said Monday (via Condotta, on Twitter). He will line up inside of Michael Bennett and Cliff Avril, giving the Seahawks one of the most talented defensive fronts in football. Richardson primarily played 3-4 defensive end with the Jets but also saw time at outside linebacker. He played 4-3 defensive tackle at the University of Missouri, though. Aaron Donald remains a holdout as the Rams begin their Week 1 preparations, but Sean McVay won’t impose a deadline on how late the All-Pro defensive lineman can report to the team and still play Sunday, Alden Gonzalez of ESPN.com reports. Rams reps flew to Atlanta to meet with Donald, but the sides reportedly aren’t close to a deal. Gonzalez adds McVay nonetheless remains “optimistic” about a solution. A two-position starter for the Broncos during the past two seasons, Michael Schofield attracted widespread interest on the waiver wire. The Chargers won out due to their position in the waiver hierarchy, but the Lions, Redskins, Vikings and Saints also put in claims on the fourth-year guard/tackle, Ian Rapoport of NFL.com tweets. A 2014 third-rounder, Schofield started for the Broncos at right tackle during their Super Bowl season and lined up at right guard throughout 2016. While Denver didn’t sport particularly effective O-lines during those seasons, Schofield clearly has believers out there. Speaking of waivers, the Seahawks hoped they’d have a chance to stash wide receiver Kasen Williams on their practice squad, Carroll said (via Condotta, on Twitter), but the Browns swooped in with a claim. The Seahawks will move on without Williams and Jermaine Kearse, traded to the Jets in the Richardson deal. Paul Richardson and Tyler Lockett are now Seattle’s top complementary wideouts, and Lockett (per Condotta, on Twitter) is expected to play in Week 1 after breaking his fibula late last season.